UCCFS Round 3: Fried Chicken (1) vs Salsa & Chips (5) – I Love It Spicy! This round will test the allegiance in the chilehead when the number 1 condiment in the US, maybe the world, goes head to head against an American staple. Can Salsa & Chips upset the number 1 seed, Fried Chicken? You must decide. Tell us why you voted in this Ultimate Chilehead Comfort Food Showdown battle. I had to go with chips and salsa. I love fried chicken but I once bit into a raw piece in a restaurant and had a mouth full of raw chicken and juice. Now, every time I bite into a piece, my throat closes just a little. I dont think I will ever get over it. With breasts and thighs I tear the meat off but with legs and wings, thats wrong. With all the great types of salsa a big bowl of it can become a meal for me. Your not a chilehead if you take fried meat over a fiery salsa! 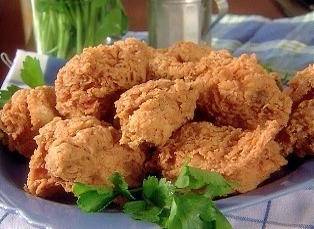 I love spicy fried chicken, like Popeyes…or just slathering some Defcon on it….yum! I love both, but I went with fried chicken. There are so many ways to make it spicy: wing sauces, seasonings in the breading…you can take whole pieces, chicken strips, nuggets, and dip them in any type of fiery condiment like hot sauces, BBQ sauces, a spicy honey mustard…fried chicken goes with so many sides and is a staple of American cuisine. I’m going with chips & salsa on this one. Not because I have anything against fried chicken, or that fried chicken is not a great excuse to eat hot sauce, but simply that I try to keep my cooking healthy so I don’t eat it too often.